Many of us will have - at one time or another - received calls to our home landlines which have been from individuals or companies trying to convince us that their products and services are the right ones of us. Although many of us recognise that this is a necessary part of their drive to gain new customers and sustain existing business it can be something of a nuisance, especially if such calls are coming through to our homes at night when we are trying to relax after a hard day at work. Traditionally it was thought of as double glazing companies and insurance salesmen who made these calls but in recent years almost every conceivable business has tried using this method of attracting new sales. Cold callers are those people who contact you at home - or indeed work - without having first asked if they can. These unsolicited calls make up a considerable percentage of all sales enquiries and also one of the most common reasons for complaint from home owners. Cold callers obviously have a job to do but the fact that they seem to do their job after we have finished doing ours for the day is one of the most commonly cited reasons for verbal and written complaints to Ofcom - the Ombudsman who oversees all aspects of telecommunication. You can of course screen your calls and the easiest and most cost effective way of doing this is to use Caller ID. Caller ID works on the principle that your telephone handset can display the number - if one is available - of anyone contacting you via your landline. This feature is already common among mobile telephone users. 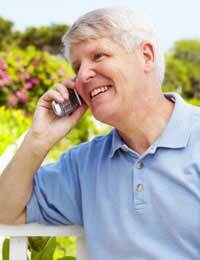 The Telephone Preference Service (TPS) is a free service that allows anyone with a telephone landline to subscribe. Once having subscribed to this free service your telephone number is added to the Telephone Preference Service's database and thus is designated as 'not to be contacted'. What this means to companies who buy databases containing names, addresses and telephone numbers for use in their sales campaigns is that your telephone number is not supplied, making you effectively 'not contactable'. The Telephone Preference Service (TPS) also acts as a mediator and if you are receiving persistent and unwanted calls then they can step in and speak to the relevant parties on your behalf, requesting that they cease to contact you further. A failure to act on any warnings given by the Telephone Preference Service (TPS) can result in hefty fines being laid down against those failing to take heed of the warnings offered. How Do I Join the Telephone Preference Service? When you first subscribe to a telephone service provider they should ask you if you wish to join the service. As we have already mentioned the service is free so there are no fees and within around twenty-eight days your telephone number will be added to the Telephone Preference Service's (TPS) database. If you already have a telephone service and have not been asked to avail of this service then you can sign up yourself at telephone preference service. It may also be worth while considering having a telephone number which is ex-directory - meaning that your number is not listed in any directories - therefore making it harder to obtain for individuals and companies other than those you wish to have it. Again most telephone service providers offer this service when you first begin service with them but if they do not then you should ask for your number to be ex-directory. I would think this was a scam. We advise you should never give details to any person unknown over the telephone. I would like to have my telephone as the ex-directory please. I had lots of nuisance in the past. If you go to http://www.mpsonline.org.uk/tps/index.html then you can register your telephone number to not receive any nuisance calls (from the UK).